The National Weather Service storm survey team went out today and surveyed damage from last night storms to determined whether the damage was from straight-line winds or tornadoes. The survey team confirmed that there were four tornadoes in north Texas last night including storms that produced damaging straight-line winds. The first tornado occurred in Johnson county near Rio Vista. This tornado began near county road 1210 south of Pat Cleburne Lake and traveled 1.54 miles to the east. This tornado was preliminarily rated an EF1 tornado with maximum winds of 100-110 mph. The path width was approximately 100 yards. The second tornado also occurred in Johnson county and was also preliminarily rated an EF1 tornado. This tornado occurred in the city of Alvarado…just southwest of the intersection of interstate 35w and highway 67. This tornado was approximately 150 feet wide…200 yards long…with estimated winds around 90 mph. The third tornado occurred in Kaufman county…on the north side of Forney near the intersection of fm 740 and lovers lane. This tornado was about 60 yards wide and approximately a half mile long. This tornado was preliminarily rated an EF1 with winds of 100-105 mph. The fourth tornado began near the town of Cash in Hunt county and ended near the intersection of fm 1564e and highway 69. the winds with this tornado were estimated to be between 100-110 mph and was preliminarily rated an EF1. The tornado track was nearly 7 miles long but the damage was non-continuous along the path. the tornado was 200 yards wide. 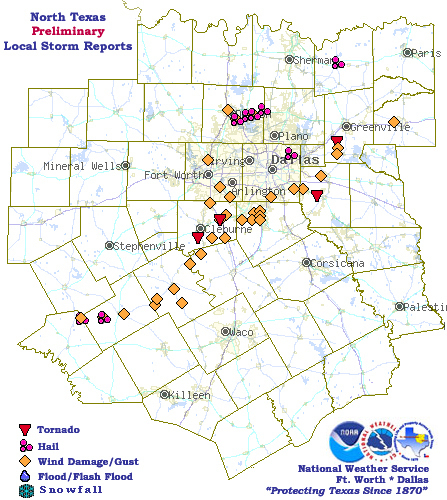 It has also been determined that straight line wind damage occurred in Bosque…Dallas…and Ellis county. The winds that caused the damage in Waxahachie in Ellis county were determined to be around 80 mph. The winds that caused damage to a church in lancaster in Dallas county were estimated at 95 mph.